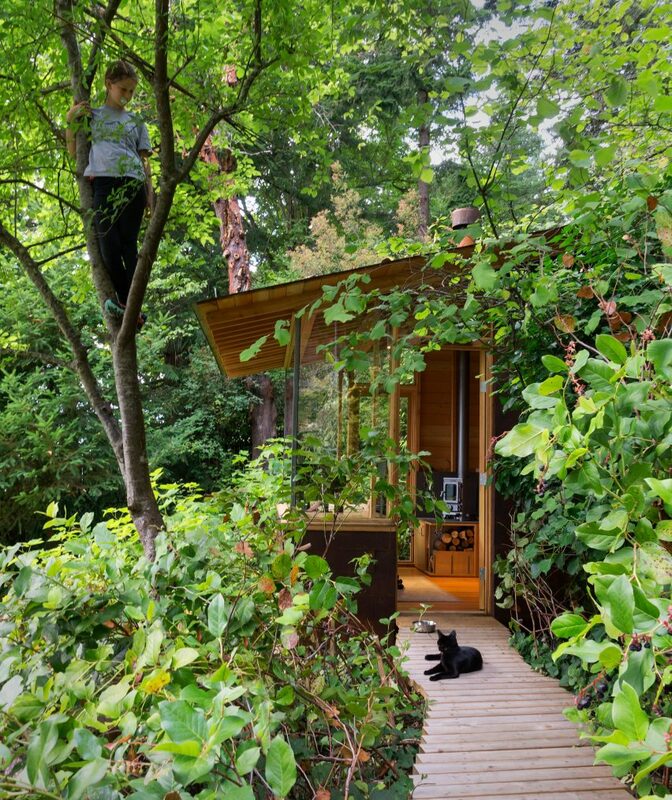 A principal at US firm Cutler Anderson Architects has created a small outbuilding at his residence overlooking the Puget Sound, which serves as both his studio and a place for his daughter to bring friends. 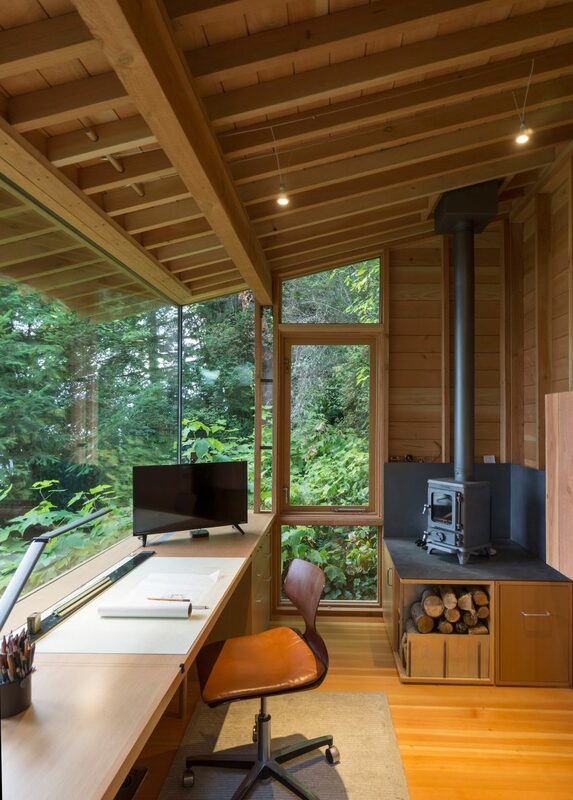 Architect James Cutler of Cutler Anderson Architects created the Studio/Bunkhouse for his home on an island near Seattle. The goal was to build a modest dwelling that could serve as a design studio and a kids’ hangout area. Specifically, the architect envisioned the space being used by his youngest daughter during sleepovers with friends. 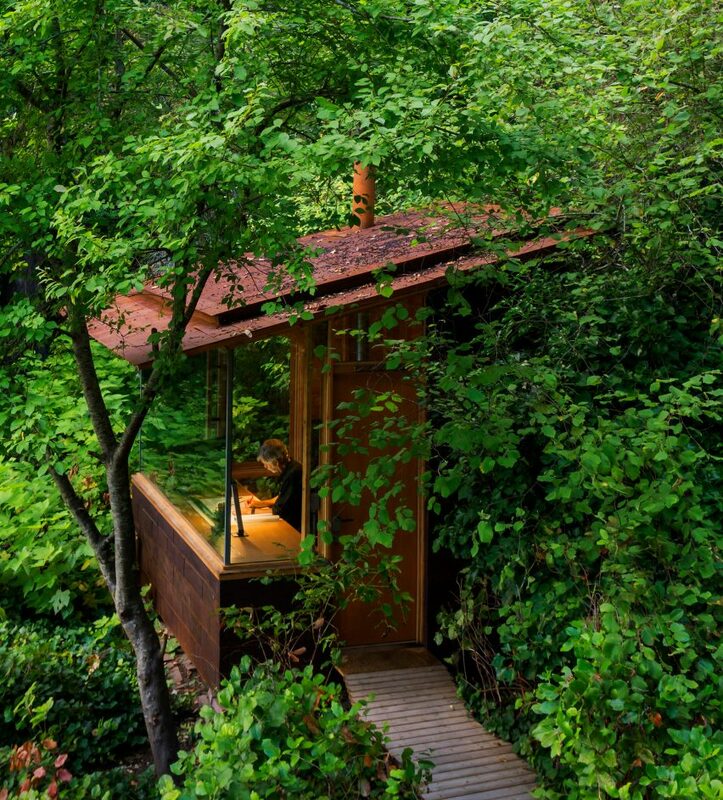 An old tool shed was razed to make way for the tiny cabin, which encompasses 80 square feet (7.4 square metres). 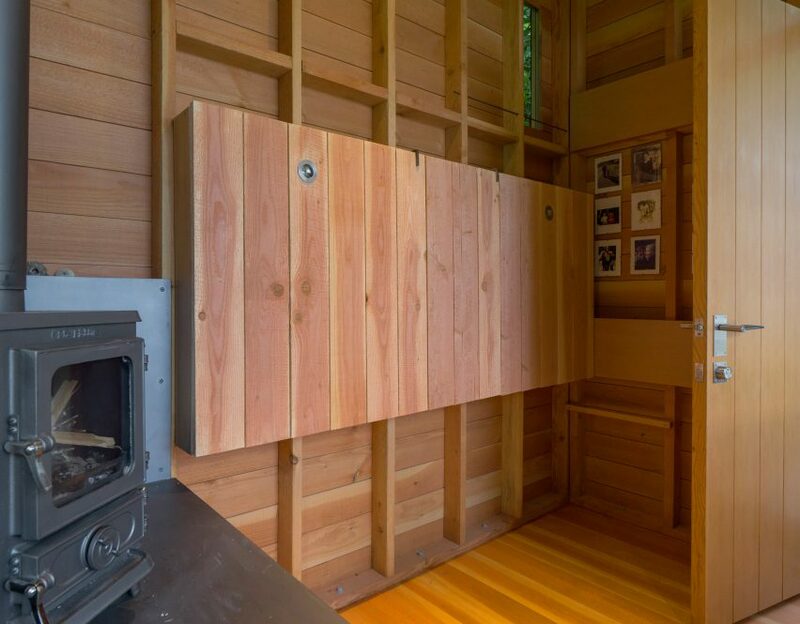 Cutler worked with his 12-year-old daughter – his other kids are grown and married – to pour the ready-mix concrete foundation and to construct the framing, made of rough-sawn Douglas fir that came from a nearby sawmill. Rigid insulation was incorporated into the building envelope, and exterior walls were clad in Corten steel shingles, which are meant to work in visual harmony with the surrounding madrone and cedar trees. The shingles were custom cut and attached with K-lath screws. On the west side of the cabin, the architect added a large stretch of glass that offers a sweeping view of the scenic landscape. Overhead, a sloped roof with a deep eave helps protect the glazed wall from the elements. A 30-foot (nine-metre) pathway leads from the main residence to the cabin. Inside, a single room features exposed timber framing, wooden flooring and shiplap wall panels. 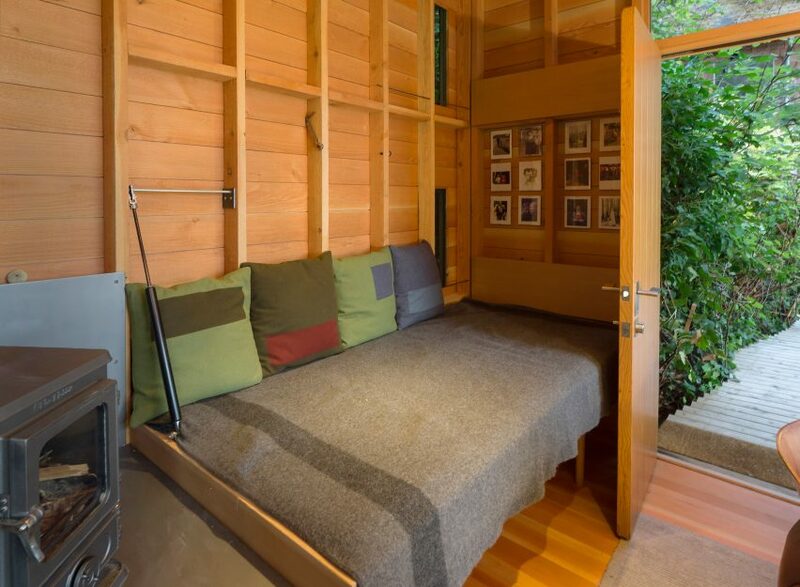 The compact space accommodates a fold-up bed and desk, which were custom-built by a local woodworker. Heating is provided by a highly efficient cast-iron wood stove, which consumes only two blocks of wood over the course of a winter’s night. To enable the cabin to be used during power outages, the architect added 4.5 kilowatts of batteries and an inverter, which are concealed behind rolling file cabinets. A small refrigerator that can run off battery power is hidden under the stove. 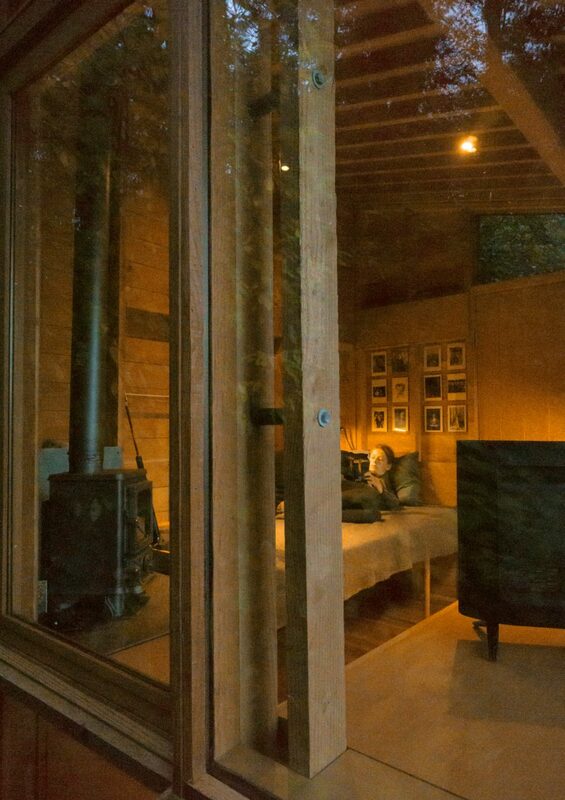 Since its completion, the cabin has evolved into more than a bunkhouse and quiet work space. “The building has surprised the designer and his family by becoming the cosy, defacto family/media room for the main residence,” the firm said. The project recently won a Small Project Award from the AIA. Given annually, the awards recognise American projects that are completed at a small scale or on a tight budget. Founded in 1977 and based on Bainbridge island, Cutler Anderson Architects is known for creating modern buildings in natural settings. Other projects by the firm include a Pennsylvania farmhouse with huge rolling shutters, and a home perched above a pond in Oregon. Photography is by Art Grice.